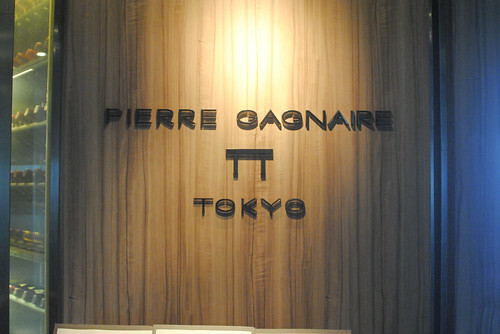 My third main foray into Western cuisine in Japan was my first time to a Pierre Gagnaire restaurant. I’ve heard some mixed reviews about Gagnaire’s lone U.S. restaurant Twist in Las Vegas, but still felt like I had to try his food for myself. A lot Japanese restaurants close on Sundays, especially for lunch, so a number of my French meals filled this gap. 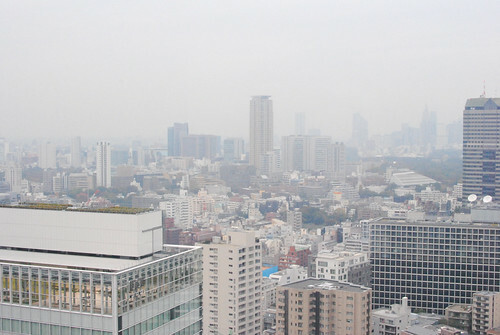 The Michelin two-star restaurant is Pierre Gagnaire’s lone restaurant in Japan, situated on the 36th floor of the ANA InterContinental Hotel. Of course, great views are offered…just not so much on this cloudy, rainy day. I thought the lunch menu was reasonably-priced with a weekdays-only prix-fixe ¥4,500 menu and a longer ¥8,000 menu offered everyday. We ordered the “four-course” tasting menu, the only tasting offered on the weekend. A la carte was also available, but the pricing seemed to really favor the tasting. This menu was actually cheaper than dining at Gagnaire’s Twist in Las Vegas, which isn’t open for lunch. 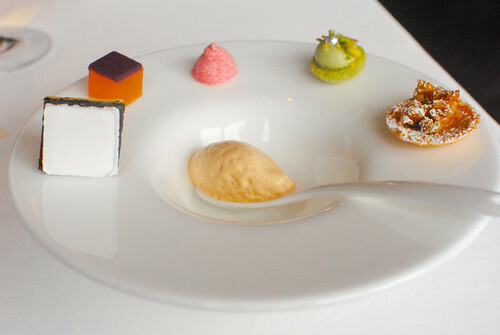 The first thing out of the kitchen was the amuse bouche, a collection of 5 separate bites; the broad variety of just the amuse would foreshadow the courses to come. Overall, I thought these were fun bites to begin with. My favorite was the ginger cookie with almond; the texture and balance of ginger and almond tones won me over. 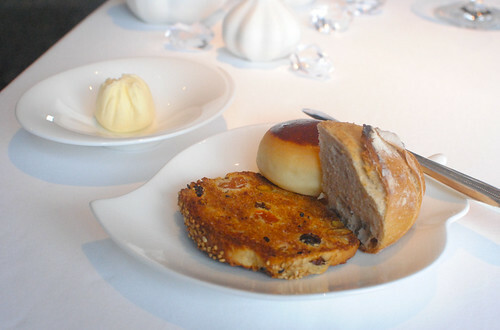 Country bread, milk bread, and a dried fruit bread were served with a very creamy butter imported from France. Just like the amuse bouche, the “first course” was a five-parter. Each one stood on its own with separate flavors so this really was kind of like five courses in one. The plates covered the table in a pretty impressive presentation. 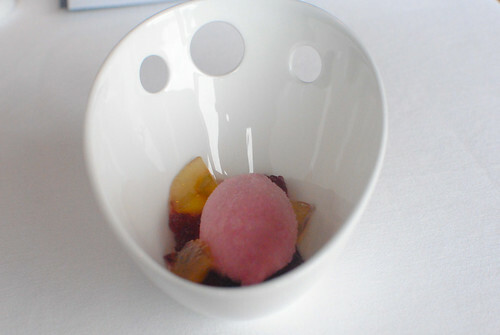 The sorbet was cool and refreshing, while I thought the grapes provided a nice fresh, sweet flavor. 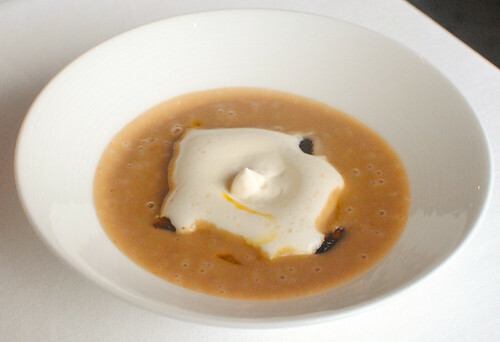 A warm and earthy chestnut soup was accompanied by a dollop of chantilly cream, which provided much of the richness. A hint of citrus balanced everything out. 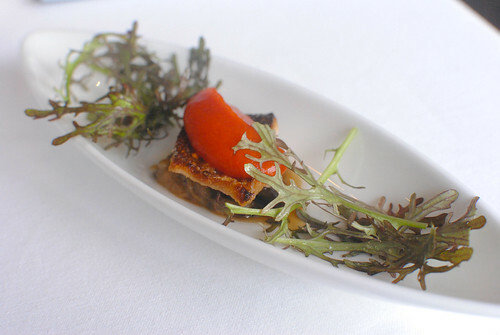 The fish was warm and crisp, cooked quite well, while a red pepper puree provided a very nice sweetness. Lightly dressed mizuna leaves lended some acidity to my favorite of the first courses. 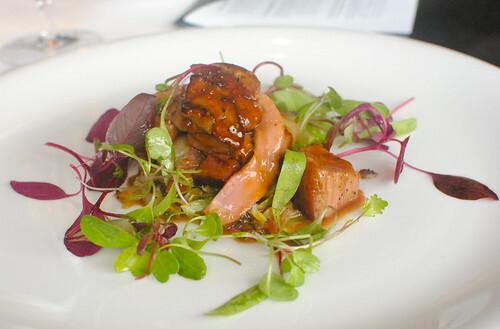 The quail was warm and smoky, countered by a crisp, tart lotus root. This dish didn’t have the same depth that I found in the others, though I really enjoyed the quail. 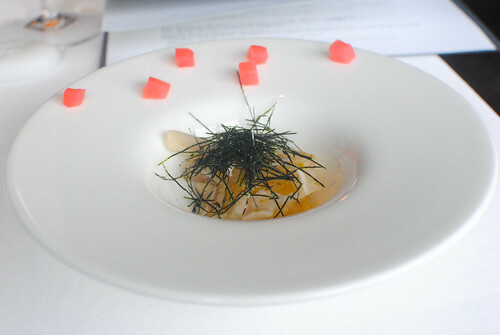 Tart sauerkraut and chewy pig ears were complemented by a bit of seaweed flavor. Not my favorite as the flavors didn’t really all come together for me. Upon completion of the first course(s), the lone entree (appetizer) came next. 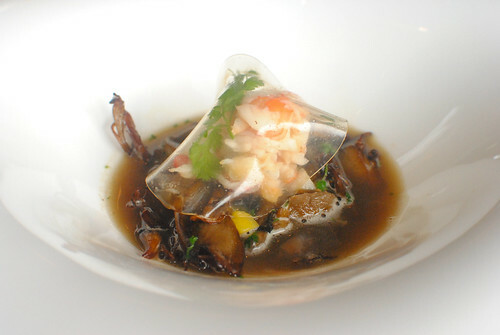 The mushrooms were sautéed until tender, exuding an umami-packed earthiness. I’m not really sure how the broth was prepared but it was delicious…showing off a ton of depth. 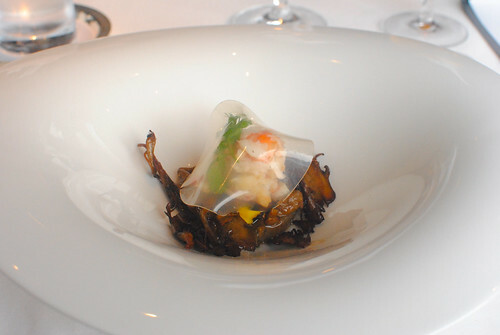 The cool, sweet crab was delicious as well, completing the sea-earth flavor combination. Really an excellent dish. For the main course, pieces of duck breast, leg and enlarged liver were all prepared pretty well with a strong cumin seasoning. I thought the duck was delicious, countered by the cabbage and greens. A rich pan sauce provided more savory depth to the dish. 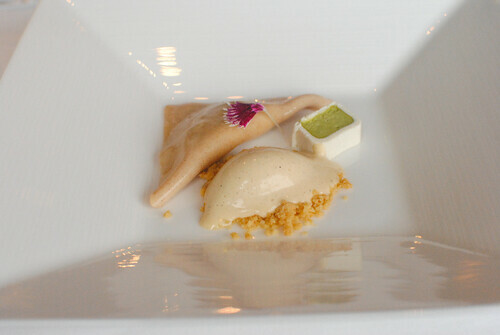 For the first sweets course, we went back to the multi-component presentation. It was pretty simple, but I thought the salted caramel ice cream was pretty tasty. The arugula cake was another favorite, with a sweetness taking over the characteristic peppery notes. 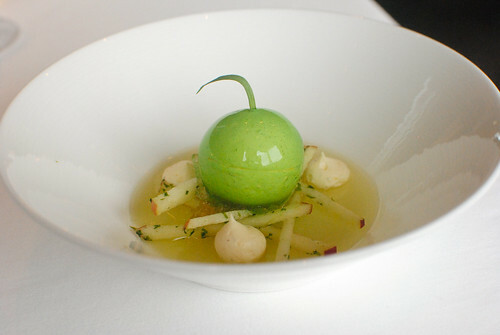 I loved the presentation of this dish with its chocolate mousse and jelly shaped into a green apple. 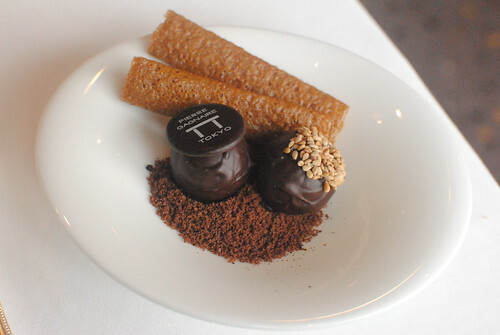 It was actually rather light, with crisp apples providing texture and tartness to balance the creamy chocolate. The wrapper had an interesting sort of al dente texture with a fruit filling. Cinnamon ice cream went pretty well with the fruits inside, while a mini green tea ice cream cake was tasty though somewhat out of place. 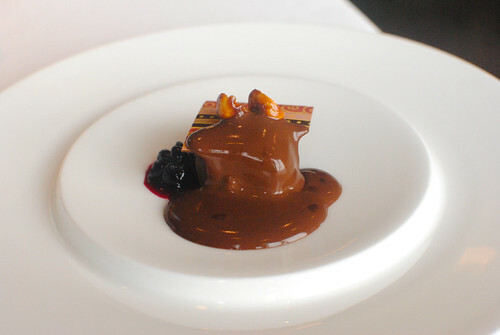 A chocolate mousse was accompanied with tart berries and a rich warm chocolate sauce on top. The chocolate and berry flavors showcased in this dessert seemed kind of conservative given the previous desserts, though I can’t say there were any complaints with the execution of it. As if we hadn’t reached a sugar-overload by this point in the meal, we were served brown sugar cookies and chocolate truffles to close out the meal. 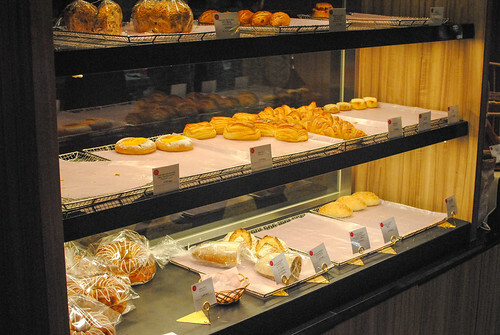 Not unlike Joel Robuchon and Paul Bocuse, Pierre Gagnaire also has his own bakery separate from his restaurant. I purchased breakfast for the next few days here. I thoroughly enjoyed this lunch. 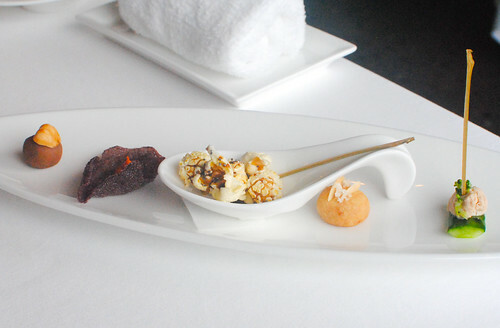 While presented as 4 courses on the menu, we had about 15 separately plated dishes outside of the mignardises. For less than half the price, I thought I got far more variety and depth of flavors here than at Beige Alain Ducasse. More importantly, I thought the creativity here was much stronger too…the most of all of the French meals I had in Tokyo. And that crab dish with the mushroom fricassee – that’ll be one of the dishes I remember most from all of the food I ate in Japan. Awesome! 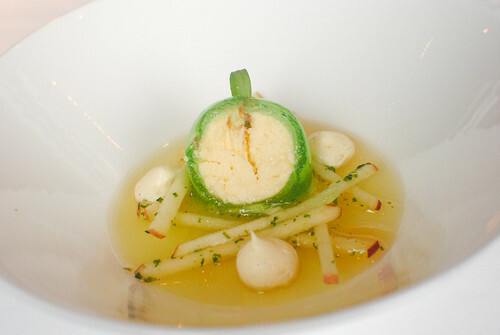 My lunch at Pierre Gagnaire in Paris was perhaps the best meal of my life. 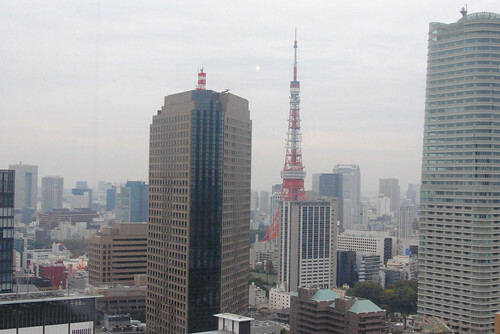 So wonderful to hear that Tokyo was great! Thanks, that’s great to hear! 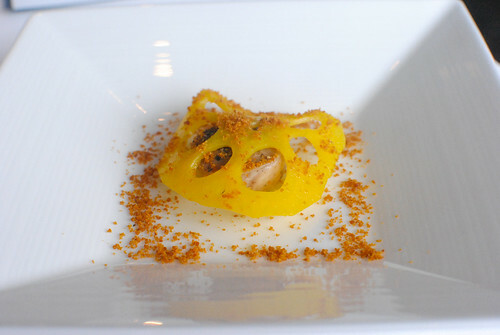 Looks like the presentation/plating is pretty similar across all his restaurants…how cool! Your photos look extremely decadent! I too dined at Pierre Gagnaire in Tokyo and Twist in LV. I noticed you dined at Sushi Kanesaka. 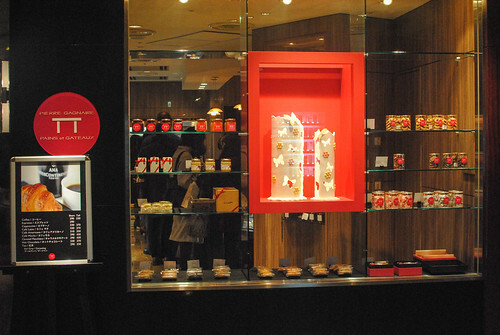 Unfortunately, I didn’t get to try Sushi Kanesaka but I plan to next time I’m in Tokyo. The duck main course and the apple dessert look spectacular! I really love how Pierre Gagnaire’s restaurants give their customers a wide array of different dishes so that they can be exposed to their flavors. Thanks for stopping by! Do give Kanesaka a try next time in Tokyo..though there’s so many great sushi options in the city. Totally agree with you on Gagnaire, it’s great to be able to sample so many flavor profiles in one sitting!